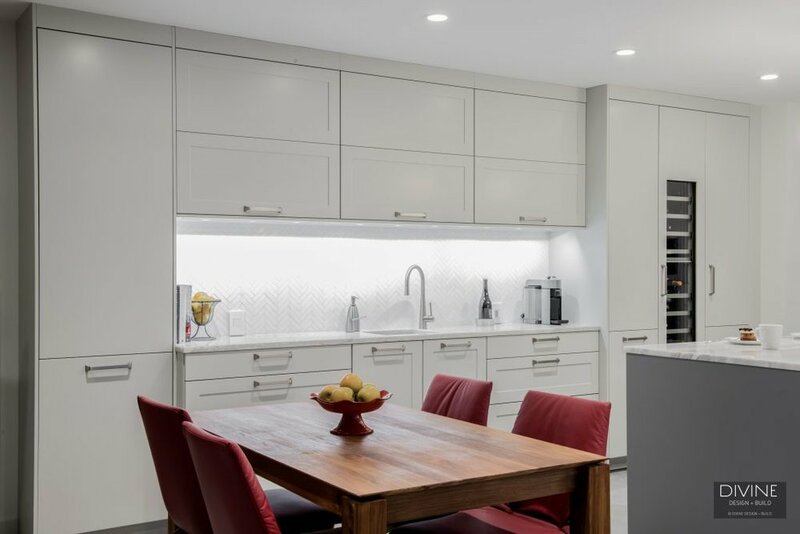 If you're designing a transitional kitchen, then you're likely going for a look that's rooted in timeless design, but with enough modern flair to make it feel fresh. Maybe you're keeping your cabinetry classic, for example, but you want accents and finishes with of-the-moment appeal. So what does that mean for your backsplash? Here are a few transitional kitchen backsplash ideas that we love. 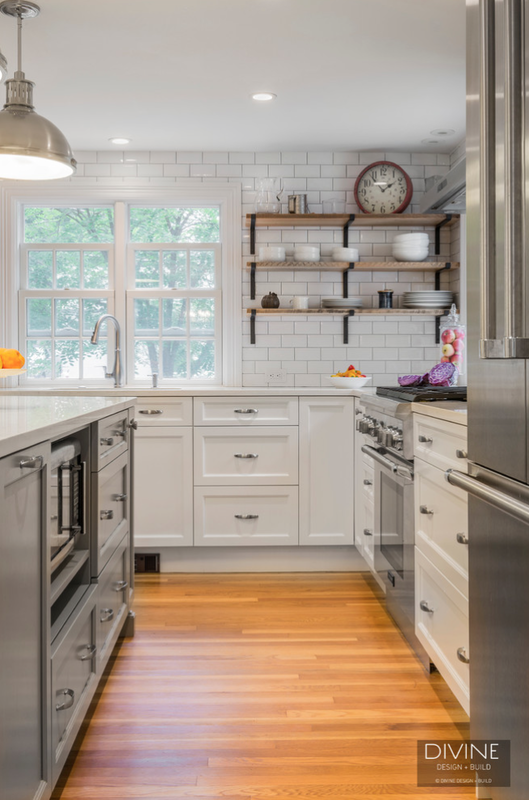 Subway tile is undoubtedly the biggest trend in transitional kitchen backsplashes. It's a classic design that's experienced a major resurgence over the last few years. The look is crisp and streamlined, yet timeless and subtle enough that you won't have to worry about it looking dated in a few short years. In other words: it's the perfect transitional backsplash material. Chevron or herringbone mosaic tile. Thin white porcelain tiles arranged in a herringbone or chevron pattern like in the photo above is a beautiful way to add a statement to your kitchen. It's smaller and more intricate than subway tile, but still has the simplicity of subway tile, especially if both the tile and grout are white. Glass or marble subway tile. The one downside to white subway tile: It's everywhere. 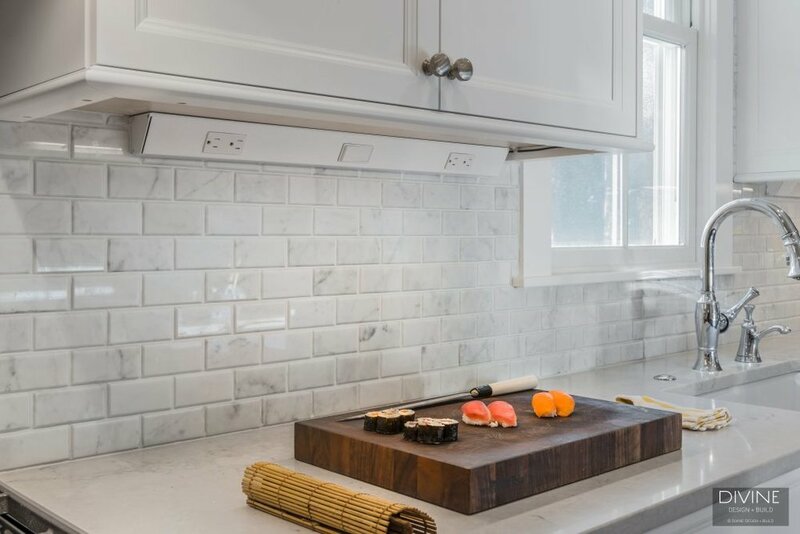 If you're looking for something a little more unique, but that preserves the clean look of subway tile, opt for a glass or marble version instead. Mosaic tile can be a beautiful addition to a transitional kitchen. To keep the look from becoming too contemporary, choose neutral tones like gray, beige, and white, or opt for natural stone tiles like in the design above. Decorative white tile is another way to dress up the subway tile look. Whether you create a framed design above the stove, or stagger relief tiles throughout the entire backsplash, it's a lovely way to add dimension and detail to your backsplash. Want to see more of the above kitchens? Visit us on Houzz, or stop by our showroom in Wellesley, Massachusetts.